Doesn't this just look like a great summer meal? 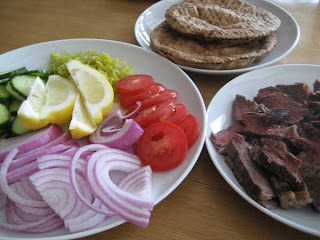 These Sliced Steak Gyros from Every Day with Rachael Ray were part of the 30 Minute Meals feature of the magazine. With a new baby around, I'm being very careful not to try recipes that are intended to be any longer than that! My husband loves Greek food, so I do my best now and then to try to make recipes that grab those flavors, since I know I will be the hero. This recipe, from the May 2008 issue, was quick and easy, as long as you aren't too slow at chopping/slicing. The toppings for the gyros are a little labor intensive, but they are worth the effort, since it's fun to make your own gyro. 1. Preheat the broiler or a grill to medium. Drizzle the steak with the EVOO; season with salt and pepper. Cook, turning once, for medium-rare, 8 to 10 minutes. Let cool slightly, then thinly slice. 2. While the steak is cooking, using a food processor, puree the feta, yogurt, lemon juice, garlic, oregano, cumin, coriander and hot sauce. Season with salt and pepper; transfer to a bowl. 3. Char the pitas under the broiler or on the grill [I tried to use the broiler to do this and it toasted them instead of charring them, so I'd use the grill next time.] Top with the steak and your choice of toppings. Serve with the lemon wedges and yogurt sauce. I just made this last week too(for the second time). It's a big hit at our house. I did season the steak with Greek Seasoning this time & I thought it was even better that way. Hmmm, Greek seasoning is a great idea. I might have to try that.